The Parking Ticket, Indicative of Everything that is Wrong with America. 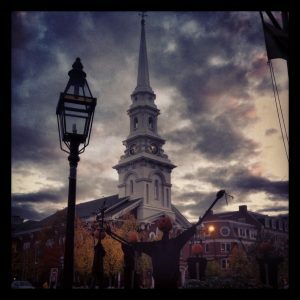 At a business meeting the other day in lovely Downtown Portsmouth, New Hampshire, I found myself running “late” in said meeting, and willingly came to accept that I would be receiving a parking ticket. I was aware of the consequences of my actions when parking in a metered space, and made a contract of sorts with the city to abide by their rules. I was an active participant. I was, therefore, willing to accept the fact that that meeting may potentially cost me at least $15 more than the $3.75 I already pumped in the meter. So before a handshake could close any deal, I was already almost $20 in the red. So to make up for it, I would have to increase the cost of work to that client, pass it on to an existing client, or decrease my profit for work I will complete. It becomes another ‘cost of doing business’ as they say. Yet, like anyone with a soul, I walk out to my vehicle to see the white mark of shame on my windshield, and anger flushes my cheeks red, even with the knowledge it was coming. However, there is always a chance, right? Not this time. I wanted to lash out at someone in anger because I came to the realization that I just spent an additional $15 for just 15 minutes of parking time. That is a dollar a minute, or $60/hour. All because I was actively engaged in a business meeting trying to improve my economic standing and provide services to local customers. It simply rubs me the wrong way. See, you need to understand some outside perspective here. Minimum wage in New Hampshire is currently $7.25 per hour. So for an entry level worker, a parking ticket could potentially consume 26 percent of their full day’s pay, which I calculate to be $58. And that $58 is before taxes. Considering a modest 25% tax burden, a day’s pay is more like $43.50. Just imagine a boss keeping an employee 15 minutes late and how potentially those few minutes could cost that person nearly 35% of their day’s pay. 35% could be eradicated from a worker’s pay, just to park a car, to work, in an economic hub. Now, I know, the above example is ‘new math’ because no one can monetize the situation accurately. 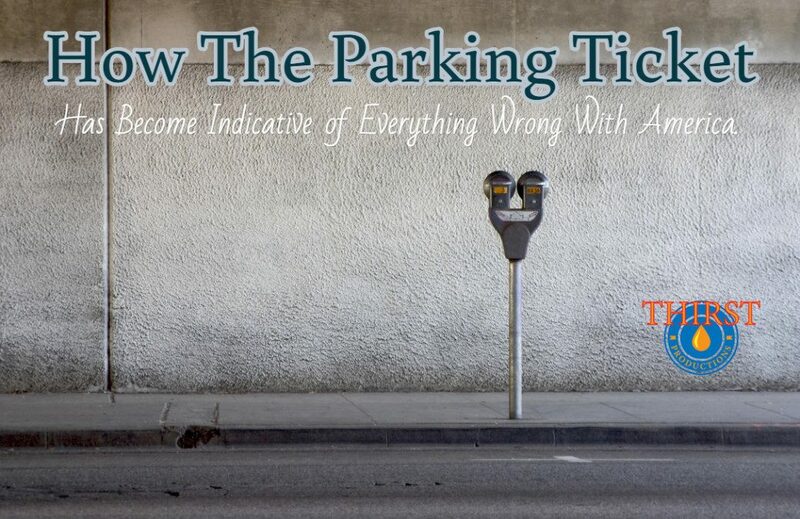 How long your car is parked after receiving the ticket is a key metric, and typically there is a choice in this town – a parking garage is available that does not provide a punishment layer to your parking. So there are choices, this is not a monopoly. I will disregard the fact that the City owns both the metering system and the parking garage(s) and save that for another discussion. Take away that the system is not fair and equal based on the individual or the crime. For those with wealth, it is a tiny inconvenience, but for those with low income, it is a big deal, and with folks on a strict budget, it can come across as a huge stressor. It is a system based on a concept of gambling – you are playing with timing issues that are often unpredictable and typically out of our control, with the odds stacked against you at all times. I cite an example: registering a motor vehicle in a City like Boston. No one knows how long you’ll be in line, could be 10 minutes, could be two days. It may be impossible for someone to predict their waiting time as too many external factors exist to guesstimate time. But the meters? They could care less. They want you to mess up. So we are back to the gamble. The City is betting that you will run late or forget, even after you put up your ante – your meter money. They also can hedge their bets just in case you leave early, by keeping whatever overpayment you may have made while simultaneously drawing income from the next parking victim who enters the spot. The double dip! And yes, we now have meters that print tickets so we can choose to park elsewhere in the city on that dime, as though anyone drives the five blocks to the other side of town to park. It is all a giant gamble that the consumer never, ever wins. A variable luxury tax for the use of the city. And to make matters even worse? 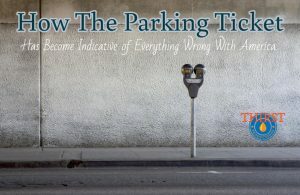 Not only are we screwed once for the errors of our errant parking, but we also face yet another gamble – the window of time to pay the initial fine. If, by some chance or act of God we forget to pay said ticket in the set number of days, the fine doubles. End of story, you are on the hook for twice the original amount. No matter if you have three screaming children to seat in the car on a busy street, and the ticket falls to the floor, lost, you are nailed with a supersized 100 percent marked up ‘fine’ for being late on your payment. Credit Cards, the corporate loan sharks of the world, will loan us free money, yet are required to max out interest rates at something like 29% annually. And they give a 20 something day grace period! But the city? A doubling of your $15 fine to $30 if you forget to pay. No warnings, no reminders, just a stab in the back to those who do not make paying that ticket a priority. Get three or more of those unpaid bad boys and the City can immobilize your vehicle – your private property and livelihood can be taken away over less than $100 owed. Forget the constitution and your basic rights; you have unpaid parking tickets! Banks and Financial Institutions were able to gamble with billions of our dollars when they started betting on the housing market, and as a result, thousands of people lost their homes and the lives they worked so hard to build. The punishment to the banks? A small fine (in the grand scheme of things) that was laughed off as the ‘cost of doing business.’ See where I am going here? By doubling the fines, we just now made income losses potentially skyrocket into 50-70% of the daily wage our minimum wage workers would pay if they happen to make a simple timing mistake and score a ticket, and forget to pay it. With all of that cash going directly to the City, an entity that many already pay taxes in to live, work, and play. So you may be saying, yes captain obvious, it is a less than perfect system but the city relies on it for revenue so back off, or they will raise taxes. Of which I can be sympathetic, but a municipality should create a fair and equitable system in which a user pays for the time they use and are not forced to gamble with their lives and livelihood to avoid a monetary punishment. If someone is in an interview for example in say, a big city where meter violation fines can exceed hundreds of dollars, what do you think happens as the clock strikes? They may ask for a moment to feed the meter, mid-interview, which would surely cost them that job, but what choice would someone with a small income have? So I have pontificated enough, let’s get to my point. See, It struck me profoundly about how pointless a system can become in the face of bureaucratic control. The utter the ridiculousness of the situation? The standard of being “late” that I was being held to was nothing more than a mechanical parking meter. My meeting should take as long as it takes without stress, hostility, or constraint – or a “punishment” for conducting my business longer than expected. A parking meter is a type of economic nanny, whether people are shopping, banking, or conducting meetings – nearly every activity in an urban downtown is economically driven. By placing monetary constraints on the act of being there, the entire system is being undermined for a few measly dollars. If you throw a hypothetical rock, you’ll hit someone who claims they no longer go Downtown as the parking situation is too out of control. What does this result in? Limitations on freedom, commerce, and access to city services. When commerce suffers, there is a well-known trickle down spending effect. If businesses in the City cannot keep customers, those businesses will leave. Real Estate opens up, and the process spirals – more open space, less rental income and reduced property values follow. Lower property values mean less property tax generated. The solution to draw more income? More parking fees, of course! And the cycle goes on, regardless of how backward it may seem. In our town, valet parking services have begun to sprout – typically backed by restaurants to alleviate some of the parking issues and fear of being hit with a parking ticket. Once again we have capitalists working around outdated, bureaucratic systems. Yet these valet systems alienate those who have less disposable income, even more than parking fines. In the end, the entire metered parking system is nothing more than government-backed, legalized gambling. There is no other way to put it; you guess how long you’ll be there, drop in your fee (and perhaps a bit more to be ‘safe’) then cross your fingers that you’ll ‘win.’ At its root, it is an unjust system, and can deeply harm the less fortunate who may have to give up a good warm meal. Cities determine the length of stay periods to maximize use of the parking spaces and keep people from squatting, so time constraints are necessary. Citizens who have little honor must be forced into obeying laws. Yet for those with good intentions, there is no forgiveness threshold for things out of our control, and the appeals process for a ticket is purported to be a pointless endeavor. So how does this all relate to what is wrong with America? Multi Layers of inequitable taxation without representation. I think I made this point earlier. Undue stress and burdens are, as always, placed on those who are less financially fortunate. Instead of providing an arena of economic growth and productivity, the metering system provides a limitation, a stressor, and a hindrance for many people to partake in the offerings the public economic center has to offer. Limits on opportunity – if parking is a serious issue for those who cannot afford it, their options for commerce and access to services is limited. There is no sliding scale cost based on income. Constant retooling and re-strategizing on ways to increase parking revenues. The battle never ends for new ways to vacuum money out of consumers, many of whom already pay city taxes. The surplus funding is rarely given back, and rates are never lowered. If more money comes in, then the idea is to spend it all! Use it or lose it as they say. As we know from toll roads, even if they say it is a temporary fee, it will never revert. Taxpayers should freely expect services to be delivered from their already existing taxes. Could a plowing tax be next? We have tolls on roads, parking meters, property tax on real estate and property tax on vehicle registration. Fines for speeding, fines for parking, late fees. Our gas is taxed, our income is taxed, yet banks are not even required to give us interest on the money they hold for us. We get the shaft at every turn, multiple times, from every different angle. It is no wonder that the notion of Bernie Sanders’ Socialism is starting to hit home with people, we are all paying out the nose for services anyhow, at the very least, allow someone to benefit. Consumers are willing to pay for said service (parking) yet asked to gamble with their time. Jobs are provided for meter cops that make next to nothing and become the brunt of everyone’s anger and scorn (the minimum wage job phenomenon). Bad jobs should not count as economic success stories. Thus, I conclude my diatribe on how the parking meter system defines what is wrong with America. We are faced with entities of bureaucracy that are being funded by, and designed to support US – the citizens – yet we are attacked from every angle for the right to exercise our freedoms. It seems silly in the long run, with people starving on the same streets, that we cannot even support the act of commerce in our cities. Nor are we able to find the money to provide services to help citizens get off drugs or feed their children. We pay people to walk the city streets to look for little red flags so the cities can make more money, and we just hope and pray that we got out of that ticket. That would really make our day.